I get the pleasure of meeting the most amazing green folks from across the planet in my work with EB and the thing that makes me feel very satisfied with my work is that I get to share all of those amazing people and their green vision with you. When I was first introduced to Sylvia Bernstein with The Aquaponic Source a few months ago, I was very intrigued with what she was doing. I had been to a trip to Epcot a few years ago and really took interest in their aquaponic exhibit. The symbiotic relationship seemed to make so much sense so when Sylvia reached out with an option that we can all use, I was all ears and decided to take you into the conversation. Shane w/ EB - So, let’s start at the beginning Sylvia, so really what is aquaponic gardening? hydroponics - or raising fish and growing plants without soil - in an integrated system. This system provides a simple way for anyone with little experience and few square feet of indoor or outdoor space, to grow organic fish and vegetables/fruits in their own home. It is pretty exciting stuff and a great conversation piece. Shane w/ EB - Okay, so that does not sound all that simple and to have your own organic veggies and fish on hand seems really valuable. Exactly how does it work and could anyone really do it? Sylvia w/ The Aquaponic Source - Haha.. it is simple because most of the hard work has been done for you by online communities and businesses like ours. There are a lot of resources out there for the DIY-minded and ready-to-go systems sold by companies like ours. The actual mechanics of how it works are fascinating, although understanding them all is not a requirement for starting your own aquaponic garden. The fish living in your tank eat fish food and their waste becomes the organic nutrient source for the plants. The plants you raise in the system then filter the water for the fish. Beyond these core components, there are also beneficial bacteria and composting worms that help in converting fish and plant waste into useful nutrients. If you learn better visually, check out our video which explains the entire system in 2 minutes. Shane w/ EB - Wow, I can even do this on my desk? I buy a pre-made system and then what? How do I end up with fish and plants? Sylvia w/ The Aquaponic Source - When you buy a system, you also buy seeds and fish “fingerlings”, or baby fish. The fish are either found locally or shipped to you directly and are guaranteed live on delivery. Our systems come with carefully written/illustrated instructions to set up your system, prepare it for fish, plant your seeds etc. Once the system is completely set up and running, it is actually quite easy to manage No weeding like in traditional gardening and no dumping and replacing of water like in traditional hydroponics. Shane w/ EB - Who is the ideal aquaponic gardner? Who are your customers? their food source. We sell a lot of systems to schools and parents that want to use the system as an educational activity with their children. We sell systems to many retirees who love gardening and want to challenge themselves. Finally, anyone at all, from a NYC high-rise to a classic homestead that wants fresh, home-grown and organic produce and fish. For any of these groups, aquaponics is a fun and space/cost-effective method of growing having easy access to organic fish and produce. Shane w/ EB - How did you first become interested in aquaponics Sylvia? once they started going to school. But I had developed a real passion for gardening so I joined what was then a new company called AeroGrow International, the makers of the AeroGarden, in 2003. I was with them for 7 years, and left in 2009 as the VP of Marketing and Product Development. In that role I came across aquaponics as I pursued an organic nutrient for the AeroGarden hydroponic systems. I thought it was an amazing way to grow, and started The Aquaponic Source, Inc. to build an aquaponic gardening industry here in the U.S.
Shane w/ EB - If readers are interested in learning more or want to dive in, where would you suggest to start? Sylvia w/ The Aquaponic Source - Like I mentioned before, there are a lot of great resources online. We have built up a huge repository of free information on our three websites. A good starting place would be a our huge FAQ. If you are the forum-type, come check out The Aquaponic Source Online Community which is the largest community of aquaponic enthusiasts on the web and is an incredible resource. Finally, if you want to dive right in, I recommend that you head over to our retail site, The Aquaponic Store. Shane w/ EB - Great, Sylvia, thanks so much for your time and all of this great information on aquaponics. I think this would be a great thing to do with my kids. Sylvia w/ The Aquaponic Source - Thank you Shane for the opportunity to spread the good news about aquaponics. Myself and The Aquaponic Source are here to help when you are ready to venture down the green path into aquaponics gardening. 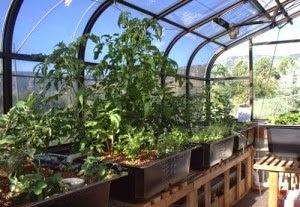 I absolutely love aquaponic gardening methods and use it to grow vegetables and herbs in my basement year round. It's a relatively cheap setup, too, once you get past the initial costs. The biggest expense are bulb changes and power costs for the artificial grow lights, but those can be avoided if you grow in a greenhouse. A great article put up by you Shane. Got to learn a lot about Aquaponics and how to grow plants indoor. Keep up with the good work. Helped a lot to start my aquaponic systems. You're sharing worthy and priceless piece of information. KEEP The good work going.